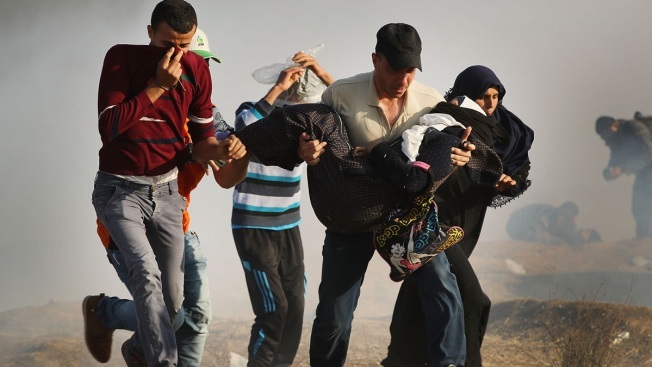 People run through tear gas carrying an injured woman at the border fence with Israel on May 15, 2018, in Gaza City, Gaza. Israeli soldiers killed over 50 Palestinians and wounded over a thousand as demonstrations on the Gaza-Israel border coincided with the controversial opening of the U.S. Embassy in Jerusalem yesterday. 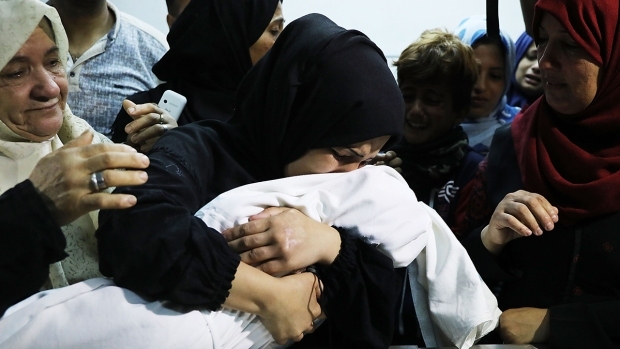 This marks the deadliest day of violence in Gaza since 2014. Gaza's Hamas rulers have vowed that the marches will continue until the decade-old Israeli blockade of the territory is lifted. Israel's high-tech military is coming under scathing international criticism for its use of live fire that killed scores of Palestinian protesters across a border — even if the protesting Gazans were burning tires, launching fiery kites into Israeli farms and in some cases trying to rip apart a border fence. The Israeli army has staunchly defended its actions. It points to the violent history of Gaza's Hamas rulers, says there have been bombing and shooting attacks against its forces and fears a mass border breach. It also says that in the open terrain of the Gaza border, with troops easily exposed, its military options are limited. The border protests are aimed largely at breaking a decade-old blockade imposed by Israel and Egypt against Hamas. The blockade, which Israel says is needed to keep Hamas from arming, has decimated Gaza's economy. Monday's bloodshed triggered widespread criticism from around the world, with many countries, including European allies like Germany and Belgium, accusing Israel of using disproportionate force and calling for independent investigations. Office spokesman Rupert Colville said rules under international law "have been ignored again and again" and that lethal force should only be a "last resort." "It seems anyone is liable to be shot dead or injured: women, children, press personnel, first responders, bystanders," he said. "They are shooting in an arbitrary way for two reasons, to punish and to deter," he said. Israel says it uses live fire only as a last resort. It says it begins with verbal warnings and leaflets dropped from the sky that urge people to stay away from the border and then resorts to "non-lethal" tactics such as tear gas to disperse the crowds. The military says snipers are permitted to open fire only when all other means have failed. Snipers are supposed to aim at protesters' legs and can shoot only with approval from a commander. Israel's greatest fear is that Hamas will stage a mass breach of the fence and enter nearby Israeli communities to kidnap or kill Israelis. Hamas also infiltrated into Israel through tunnels during the 2014 war, killing at least six Israeli soldiers, according to Israel's Foreign Ministry. Since the war, Israel has uncovered and destroyed several additional tunnels. "We have no choice," Conricus said. "There's no way we have the leniency or the flexibility to allow rioters to tear down the fence, for terrorists to come through following those rioters and get into Israel and terrorize Israeli civilians."